What do you do when you’ve told your kid to go take a bath several times nad he’s still lounging around in underwear reading a graphic novel about Elizabeth Cady Stanton? Baaaaath time! I mean it this time! In! The ! Bath! Five minutes later it’s all about Cady Stanton again. Oh okay! I see how this is gonna roll! VOTES FOR WOMEN! I sream belligerently. That got his attention. BATHS FOR KIDS! I yelled as if directing a protest march right into the tub and yet also into some far distant utopian future. BATHS FOR KIDS!!!! Moomin cracked up and got in the tub. I felt super happy to have the sort of kid who reads and ignores me. This shows a proper respect for authority! This entry was posted in Comics and tagged biographies, books, comic books, graphic novels. Bookmark the permalink. 3 Responses to Votes for women! Baths for kids! I had the similar experience in my childhood with my mom. She use to shout the same to make me go and bath. 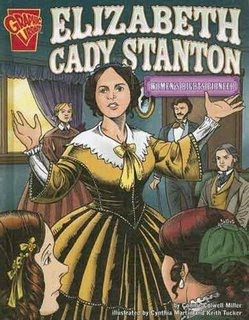 Cady stanton is a wonderful novel to read and it has a very good story.